This pasta salad is a great meal for those hot summer days, or any time of the year. It’s versatile, and can be changed to suit your tastes. It’s also very easy to bring together in very little time. Boil the pasta according to package instructions. For pasta this small, two or three handfuls per person is a good measure. Go for two if this is a side, three if it is the main dish. Chop your tomatoes, peppers, olives and scallion into fine pieces. Drain your pasta, and pour it into a large bowl. Add about ½ tsp margarine per serving in the bowl. Stir to melt. Add in your vegetables. Add in your small cooked shrimp. (you may omit the shrimp if you prefer) Add about ½ tsp of dressing per serving in the bowl. Add your Parmesan, as much as you like and the almond slices. Stir to cover all ingredients well. You may serve this dish warm, or chill and serve later. I like to serve it warm. 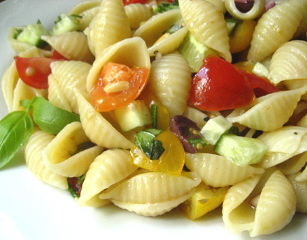 You can also vary this pasta salad any way you like, by changing the vegetables. You might try green olives, hot peppers, chopped pepperoni instead of shrimp, add croutons, or other variations to suit your tastes. For those who like things spicy, you may want to stir in a few drops of hot sauce before serving.